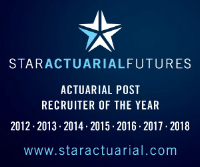 A new client of mine within the Life and Pensions industry is looking to hire a contract actuarial aggregation lead. I am looking to speak with Senior Qualified Actuaries with over 10 years PQE and extensive experience within Solvency II. Ensure all relevant issues are identified so that suitable solutions are designed. Ensure that links between different work streams are addressed to ensure a consistent, holistic solution. Manage ongoing requirements of the various internal and external stakeholders e.g. BAU production functions, Board, PRA and internal and external audit to ensure that the requirements are met. Apply governance and controls that are in place to create an appropriate control framework. Actively challenge existing processes and methods to improve quality and controls of output, recognising that the incumbent is not the owner of the processes and methods and needs to manage the relationships with owners. Contribute to the business by providing actuarial input and wider business understanding related to Solvency II so that Solvency II is implemented in an optimal way for the business. To task manage 4 to 5 direct reports and oversee a team of up to 20 technical and actuarial staff, including matrix management and contractors.